Lunch – leftover chicken saltimbocca (I only ate the chicken and some of the corn, because the pasta was pretty bland after reheating it. Later at night – 1/2 cup of Chinese eight treasure soup (not the congee type) that my mom made in a pressure cooker that day. Also 1 banana at 4am because I couldn't fall asleep before the morning exam… yikes! Breakfast – one toasted english muffin with peanut butter and shredded pork sung on top (um, the pork sung was my mom's doing… haha I would have been okay with just peanut butter and honey or something), 1/2 cup of warm milk (this is a Chinese comfort drink thing… my family always drank hot milk when they were living in China, which apparently the thing to do). During the MCAT – you get 10 minute breaks between each section. During the first break I drank some Propel fitness water (I couldn't find any Gatorade in the house, so this was second best) and ate half a package of Special K snack bites. Second break was more Propel plus the rest of the snack bites. For the last break I ate some roasted cashews and had a kid sized KitKat bar, with more Propel. The test took a total of about 5.5 hours, so it was good to have those little breaks to unwind between sections and refresh yourself. Dinner – Fresh steamed blue crab (my mom bought these alive from the local Chinese market… they're about the size of your hand and don't have a whole lot of meat, but they're really tasty! Their meat is much finer than that of king crabs or dungeonesses. Plus they're all female crabs, so they have lots of crab eggs (roe) inside, which are a delicacy for Chinese people), fresh roast pork from the Chinese market (this stuff is awesome when it's fresh, especially with a little bit of char on the edges), mung bean sprouts, and Shanghai bok choy. 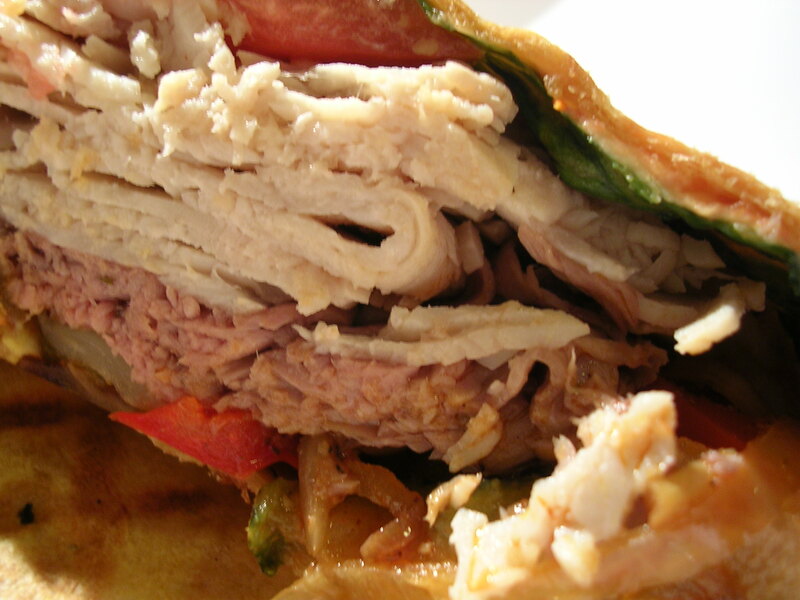 Dinner – 1/2 a tomato tortilla wrap with turkey breast, roast beef, lettuce, tomatoes, caramelized onions, roasted peppers, and roasted zucchini. 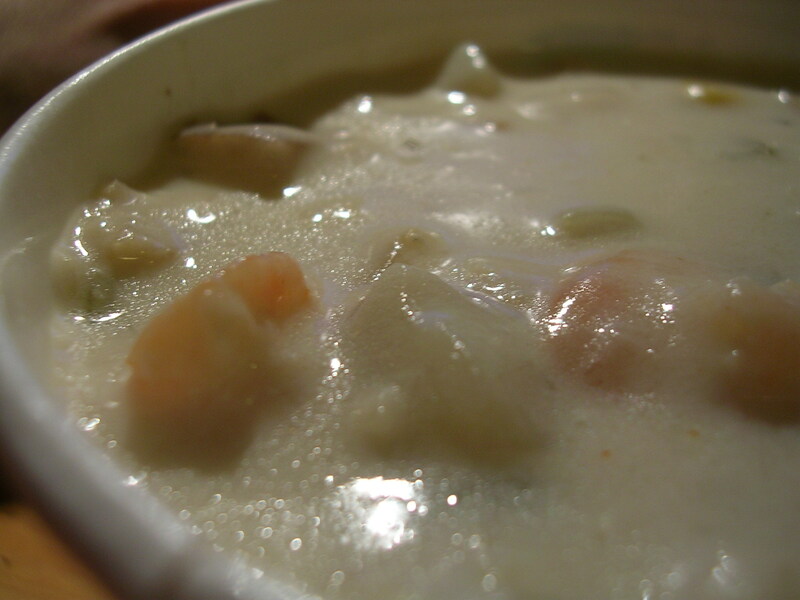 1/3 bowl of seafood chowder. Later at night – small handful of cashews. This entry was posted on Monday, April 9th, 2007 at 9:47 pm	and posted in breakfast/brunch, Chinese, cooking, desserts, fruit and nuts, poultry, seafood, snacks, soups, Uncategorized. You can follow any responses to this entry through the RSS 2.0 feed.